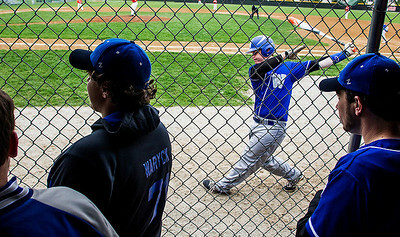 Kyle Grillot - kgrillot@shawmedia.com Woodstock's Austin Butts warms up as other players in the dug out cheer on teammates during the fourth inning of the boys baseball game Thursday in McHenry. 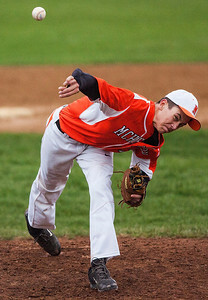 McHenry scored 7 runs in the last inning to beat Woodstock, 8-7. 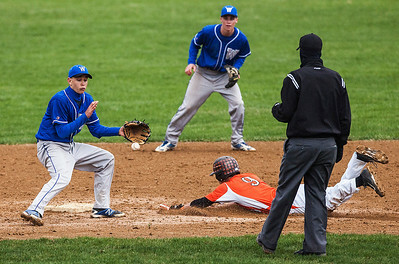 Kyle Grillot - kgrillot@shawmedia.com Woodstock's Alex Ferguson (left) drops the ball as McHenry senior Cody Freund (9) slides safely to second base during the third inning of the boys baseball game Thursday in McHenry. McHenry scored 7 runs in the last inning to beat Woodstock, 8-7. 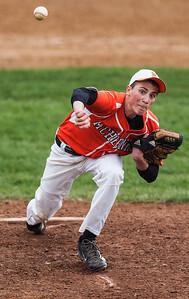 Kyle Grillot - kgrillot@shawmedia.com McHenry freshman Bobby Miller pitches against Woodstock during the third inning of the boys baseball game Thursday in McHenry. McHenry scored 7 runs in the last inning to beat Woodstock, 8-7. Kyle Grillot - kgrillot@shawmedia.com McHenry Brian Kennedy pitches against Woodstock during the sixth inning of the boys baseball game Thursday in McHenry. McHenry scored 7 runs in the last inning to beat Woodstock, 8-7. 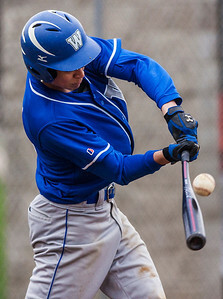 Kyle Grillot - kgrillot@shawmedia.com Woodstock's Jordan Sumner hits a double in the fifth inning of the boys baseball game Thursday in McHenry. McHenry scored 7 runs in the last inning to beat Woodstock, 8-7. 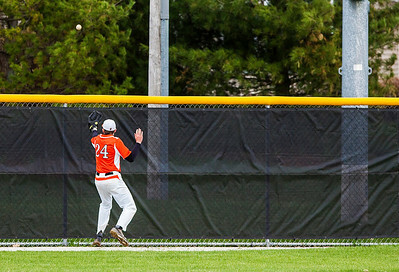 Kyle Grillot - kgrillot@shawmedia.com McHenry's Mike Borst watches as Woodstock's Eric Bell's ball bounces off the fence out of the park for a home run during the sixth inning of the boys baseball game Thursday in McHenry. McHenry scored 7 runs in the last inning to beat Woodstock, 8-7. Kyle Grillot - kgrillot@shawmedia.com McHenry freshman Bobby Miller waits in the dugout as the McHenry team heads out onto the field for the bottom of the sixth inning of the boys baseball game Thursday in McHenry. 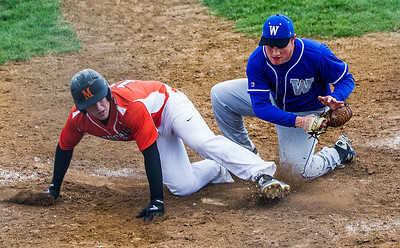 McHenry scored 7 runs in the last inning to beat Woodstock, 8-7. Kyle Grillot - kgrillot@shawmedia.com McHenry senior Cody Freund (9) attempts to tag Woodstock's Mike Borst out at home base during the seventh inning of the boys baseball game Thursday in McHenry. McHenry scored 7 runs in the last inning to beat Woodstock, 8-7. 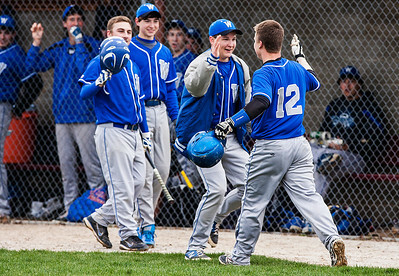 Kyle Grillot - kgrillot@shawmedia.com The Woodstock team celebrates with Eric Bell (12) after hitting a home run during the sixth inning of the boys baseball game Thursday in McHenry. McHenry scored 7 runs in the last inning to beat Woodstock, 8-7. 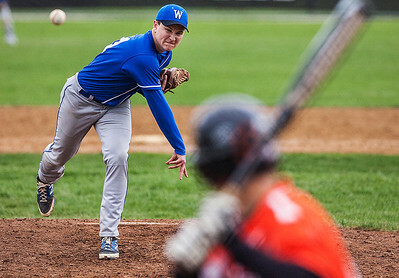 Kyle Grillot - kgrillot@shawmedia.com Woodstock's Austin Butts pitches against McHenry during the seventh inning of the boys baseball game Thursday in McHenry. McHenry scored 7 runs in the last inning to beat Woodstock, 8-7. Kyle Grillot - kgrillot@shawmedia.com Woodstock's Jace Pohlman tags McHenry junior Ryan Gannemann out at home base during the seventh inning of the boys baseball game Thursday in McHenry. McHenry scored 7 runs in the last inning to beat Woodstock, 8-7. Kyle Grillot - kgrillot@shawmedia.com Woodstock's Alex Ferguson watches as McHenry senior Cody Freund celebrates with freshman Bobby Miller during the seventh inning of the boys baseball game Thursday in McHenry. McHenry scored 7 runs in the last inning to beat Woodstock, 8-7. 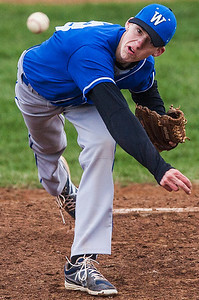 Kyle Grillot - kgrillot@shawmedia.com Woodstock's Zach Kammin pitches against McHenry during the seventh inning of the boys baseball game Thursday in McHenry. McHenry scored 7 runs in the last inning to beat Woodstock, 8-7. Kyle Grillot - kgrillot@shawmedia.com McHenry freshman Bobby Miller (22) exits the field with his team after hitting the winning ball during the seventh inning of the boys baseball game Thursday in McHenry. McHenry scored 7 runs in the last inning to beat Woodstock, 8-7. 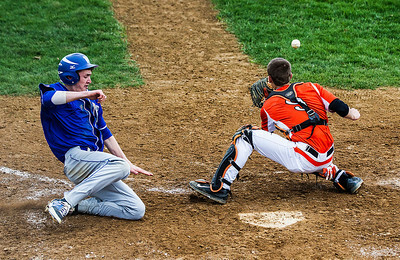 McHenry senior Cody Freund (9) attempts to tag Woodstock's Mike Borst out at home base during the seventh inning of the boys baseball game Thursday in McHenry. 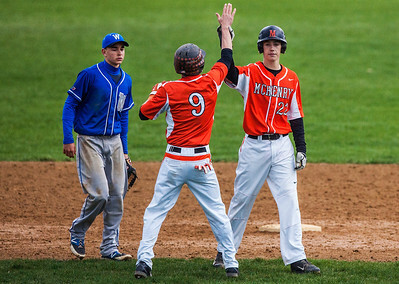 McHenry scored 7 runs in the last inning to beat Woodstock, 8-7.